The longer you play guitar, the more likely you are to experience some pain, injury or discomfort in your shoulders, back, neck, arms, wrists, or fingers. Pain is your body’s signal to you that something is wrong. Fortunately, most guitar playing injuries can be prevented by taking care of your body and by using good practice hygiene habits (described below). If these measures do not help you relieve your pain, see your physician to get proper diagnosis and treatment. Disclaimer: this article is NOT medical advice and is NOT a replacement for diagnosis or treatment by a qualified medical professional. 1) Improper posture when playing (and practicing) guitar. You are most likely to feel pain in your shoulders, back, neck, arms, and wrists when you play guitar. Improper posture creates unnecessary tension in your body and causes microscopic injuries in the soft tissues of muscles, ligaments and tendons. These microscopic injuries are called “micro tears”. Excessive micro tears can lead to inflammation, swelling, tingling and numbness, nerve impingement and severe pain. These injuries can happen in a short period of time during a single practice session or can accumulate over many sessions. Cumulative injury from poor body mechanics can result in carpal tunnel syndrome, tendonitis, bursitis, or other repetitive stress injuries. Shoulders- Keep your shoulders in a relaxed natural position. Do not raise your shoulders up while playing. Some guitar players make it a habit to raise their shoulders while playing on the lower frets and then bring them back down on the higher frets (or vice-versa). Use a wide, comfortable guitar strap if you play guitar standing up. This keeps you from hunching up your shoulders (or slouching) to reach your guitar. Back- If you slouch when you play guitar, you will eventually experience neck or back pain. Keep your back straight. If you play seating down, use an adjustable chair set at a comfortable height. Use a foot stool, so that you are not straining to hold your guitar in the correct position. Arms/ Elbows- Many times people play with their arms/elbows raised up almost horizontal. This creates a lot of tension, and can cause pain in your forearms or elbows. Your fretting hand elbow should stay close to your body, but not directly up against it. Your picking arm should come around the front of the guitar and find a natural and relaxed position from which to pick and strum the strings. Wrists- Wrists are a very common area of pain for guitarists. Many times this is due to static tension and excessive bending of the wrist. While fretting notes on the guitar, your fretting wrist should only bend moderately as you curve your fingers to reach for strings. Raise the height of your guitar to reduce bending, if necessary. 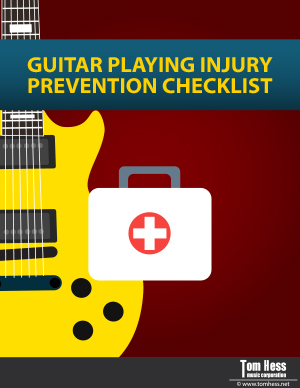 To help you remember these tips, download this free Guitar Playing Injury Prevention Checklist (you don’t have to enter an email address). Review it periodically to make sure you are practicing as effectively as possible. 2) Applying too much pressure with your hands. Many guitar players press down too hard on the strings, creating a lot of excess tension throughout the body. If you feel tenderness in your fingers after developing calluses - you are using too much pressure on the strings. This is especially true for electric guitar. Use just enough pressure to push the string against the fretboard and obtain a good tone, and no more. Do your best to relax the fingers that are not playing notes. (Want to eliminate excess tension from your guitar playing forever? Download this free guitar technique eGuide and learn how to make your guitar playing feel easier than cutting butter with a hot knife. 3) Not warming up properly, or at all. As a guitar player, you are just like any athlete training your muscles to make specific and complex movements. When your muscles are cold (not warmed up), you are more likely to develop micro tears that lead to injuries. This is particularly a problem during the winter months. Tip #1: Warm up your hands by soaking them in warm water. Do NOT put your fingertips in the water (this makes your calluses soft and playing guitar becomes more difficult). Only soak the backside of your wrists in the water. Tip #2: Start your guitar practice by playing the exercises you intend to practice for the day, played very slowly. Pay attention to your picking hand technique, fretting hand technique, posture and body mechanics covered earlier. playing with these free tips. speed in your guitar playing. 4) Playing or practicing guitar for long periods of time without sufficient breaks. Avoid practicing guitar for hours on end without taking a break. This can cause aches in your wrists, arms, or elsewhere in your body. Take a 10-minute break for every 45-50 minutes of guitar practice to give your body a chance to rest. In addition, pace the intensity of your guitar practice. Do not suddenly increase the frequency or intensity of your practice sessions. This is a quick route to severe injuries. Increase the intensity gradually. 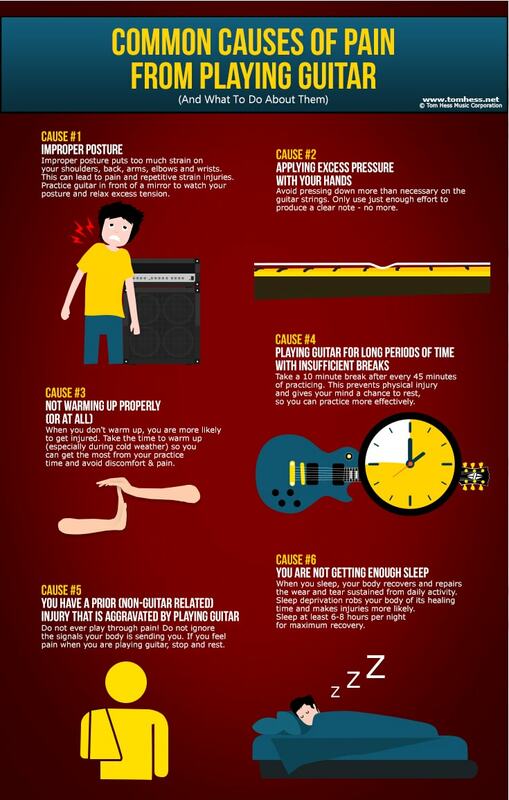 5) You have a prior (non-guitar related) injury that is aggravated by playing guitar. This principle is critical and cannot be emphasized enough: Do not ever play through pain!!! If you feel pain when you play guitar, stop and rest. This may require you to take a week or two off from playing guitar. If that's how long it takes for your body to heal, so be it. Isn’t it better to rest for 2 days than to deal with painful complications from an injury? When you play through pain, you risk turning a minor, short-term injury into a much worse, long-term injury. You may not notice that the pain is getting worse until it is too late for preventative measures to help you. Before you know it, your arms and wrists will be throbbing or numb and you'll have to seek medical attention. Note: there is a big difference between fatigue and pain. Fatigue is a dull burning sensation that builds gradually. Pain feels like a sharp stab that happens very suddenly. Fatigue is usually not serious and it usually goes away after a few seconds. Pain is ALWAYS serious. 6) You are not getting enough sleep. When you sleep, your body rests and devotes its energies to repairing the wear and tear sustained during your daily activity. Sleep deprivation robs your body of its healing time. Sustained sleep deprivation makes injuries more likely to develop and harder to heal. Good “sleep hygiene” is essential to getting a good night’s rest and staying healthy. It is worth the effort to implement these practices. For any severe or persistent problem, consult your doctor immediately! Rest is very important. If you notice pain while you play, stop playing your guitar and rest until you no longer feel the pain. It is vitally important to rest to allow your body to heal. If you experience pain even after you have stopped playing, you may have inflammation in that area of your body. Ice helps to reduce swelling and inflammation. The safest and most effective type of icepack is crushed ice topped off with water in a self-sealing plastic bag. You want the pack to be cold enough to anesthetize the injury, and reduce swelling, but not so cold that you freeze-burn the skin. If you do not get the area cold enough, icing won’t help you. Most commercial ice packs are too cold and require a cloth barrier. Unfortunately, a cloth barrier is usually too thick for the cold to reduce inflammation. Instead, use a towel wrapped around the icepack instead. It will be cold enough to drive out inflammation and reduce swelling, but will not freeze-burn your skin. Use for 7-10 minutes at a time. You may repeat this treatment 2 or 3 times with 15-minute breaks. The hardest part is getting through the discomfort of the initial contact with the ice. Never run warm water or use a heating pad over inflamed areas. This makes the inflammation worse. If you have wrist or forearm pain, wearing a brace or splint could greatly reduce the pain you feel. These products compress, support and minimize movement in a painful area. Most splints and braces are designed to be worn at night while you sleep. Splints and braces should not be used near open wounds or over bone fractures or deformities. Do NOT use them to relieve symptoms of chronic diseases. If your injury requires bracing, then it is serious enough to see a doctor. If the pain persists after trying these suggestions, consult your physician. Let him or her know what symptoms you are feeling and what you have already tried to relieve the pain. Want to learn more ways to prevent guitar playing injuries and play anything you want as fast, cleanly and accurately as you want? Download this guitar technique eGuide and learn how to play guitar the way you only wish you could play right now. Transform your guitar playing into totally awesome, top-level guitar playing - take online guitar lessons.